My experience in web development includes PHP programming, database administration, server administration and some basics about web design. So my contribution to the following projects include administration of the servers on which they run, tuning the platform, developing of modules and web design (on some of them). 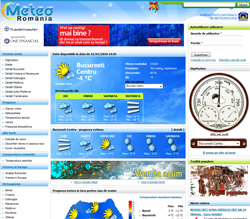 Meteo Romania is the site we developed as a result of our business collaboration with the National Meteorological Administration in Romania. The site itself is based on Drupal and displays weather information, forecasts, maps and articles from the meteorological area. As its back-end I implemented a data repository, with web service interfaces, that structures all our meteorological data in a centralized database. MStats is a mobile statistics service that was implemented when the need of a centralized statistics platform for our mobile pages emerged. Now, it’s main asset is the data processing algorithm, that was tuned for high loads. Being only at its beginning, it runs now only on one server, but it’s been developed with scalability in mind. My contribution here was especially on the data processing algorithm. Rring! Movies was the first YouTube-like service in Romania, and still is the only one to have a mobile interface. So its main features include content transcoding for mobiles and web. The site has been implemented entirely by me. Rring! is our mobile and gadgets news portal. We constantly offer fresh news from the world of cutting-edge mobile technology and gadgetry and content for customization. De Mirare is my dearest personal project. 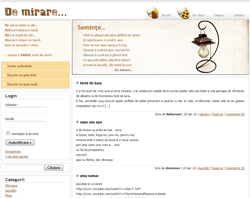 It’s a blog-like web site where users post stories, poems, interesting movies or pictures. All non-conventional, with a different idea, with a different perspective. De Mirare means “intriguing” so this says it all!